Since the Native American people relied so heavily on nature and everything that was found in their environments it is no wonder that much of the Native American clothing was made from the hides of the animals that roamed their tribe’s territories. Native American men from tribes in warmer climates simply wore loincloths; a loincloth is a long piece of hide tucked into a belt that hangs down in front and back. In the colder climates many men wore loincloths but would also wear leggings made from hides and fur to protect their legs and keep them warm in the winter months. 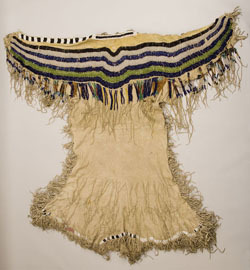 Native American clothing varied greatly from tribe to tribe as well. Each tribe was easily recognized by their style of clothing. Much of the different tribal Native American clothing was adorned with things such as feathers, porcupine quills, and other colorful things that had symbolism to their tribes’ culture. There are other tribes wear the men would wear kilt type garments or sometimes even pants made out of animal fur, sometimes the pants would just be made out of soft leather and have fringes down the sides of the legs. On their feet most tribes wore some form of moccasins that they fashioned out of animal hides, these protected their feet and with soft leather soles helped them remain quiet while hunting. Some tribal men from certain tribes would also adorn their heads with feather headdresses, and these usually had significant meanings, from the colors of the feathers to the number of feathers. The Native American clothing worn by Native women was usually skirts made from animal hides and they would wear fur leggings underneath in the colder regions. The leggings the women would wear would usually come only to their knees, since that was the part of their legs that were exposed under their skirts. Sometimes in certain tribes the Native American women would attach their leggings to their moccasins, making a sort of boot. Much of the Native American clothing you would see would be painted or decorated in some sort of way customary to their tribe. 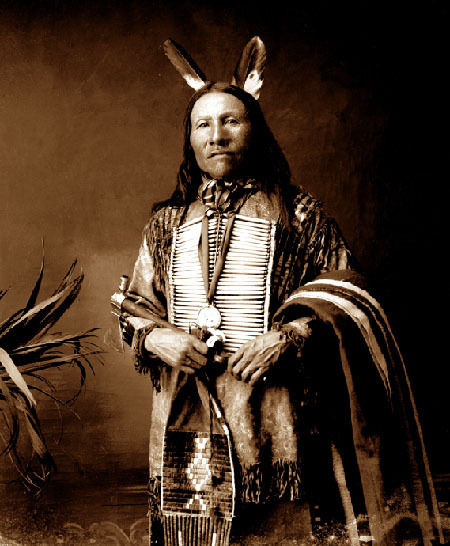 Over the years Native American clothing evolved and some tribes were able to trade and get cloth or beads, they could make clothing out of cloth and they would use beads as added decorations to their clothing. Native Americans would also have things sewn into their clothing to symbolize a great achievement, or for being a great warrior. Other times patterns would be sewn in just as added decorations. When the European settlers arrived some of their styles worked their way in Native American culture.